A man has been airlifted to hospital after a serious two car collision which has closed the A142 in the Cambridgeshire Fens this afternoon, Wednesday August 10. The road is currently closed in both directions between the A1421 Witcham Toll junction and the Witchford roundabout. Officers were called at 1.22pm to reports of a collision involving two vehicles, a white Kia Venga and a blue Ford Fiesta Zetec. 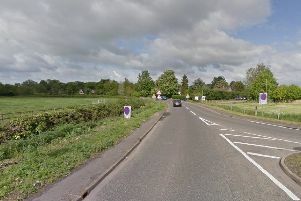 A man, the driver of the Kia, is believed to have suffered life threatening injuries and has been taken to Addenbrooke’s Hospital via helicopter. His passengers, a woman and child are believed to have received minor injuries. The driver and passenger of the Ford were not injured. Anybody with information about the collision is asked to call police on 101.